When the asparagus starts showing up at the farmer's market every year I know I have made it. Spring has (un)officially arrived and warmer weather is on the way. Now it's the middle of June and I've been buying asparagus almost every week at the farmer's market. It's been great!! 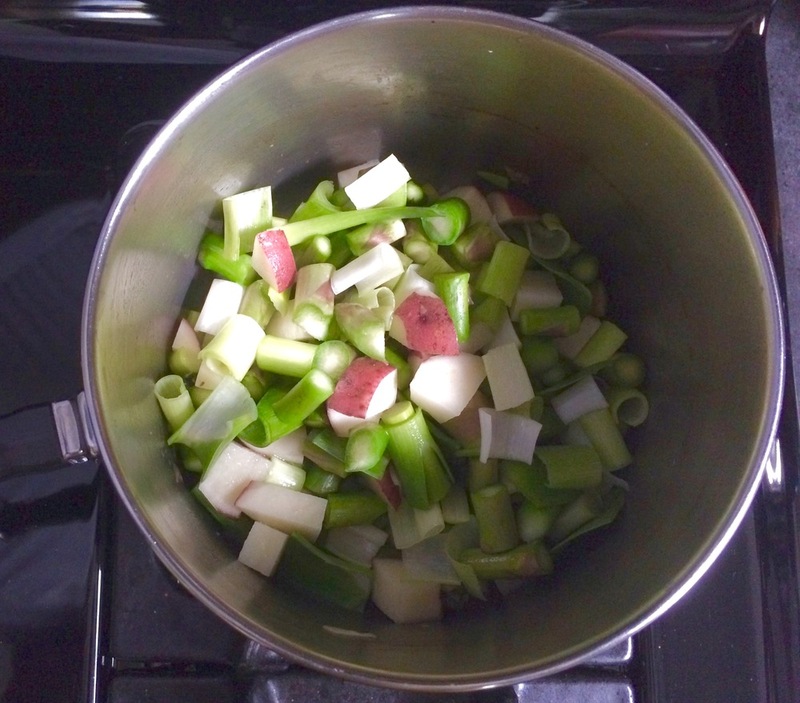 This past week I decided to try something new with my asparagus, something I've never done before - making a vichyssoise. Of course I was familiar with the name vichyssoise, and I had a vague sense of what this soup was, but until this past week I couldn't have really defined it exactly. Well now I know! I was excited to try this asparagus vichyssoise first of all because I love asparagus, and second of all because it gave me another opportunity to use my new favorite kitchen toy, a new Vitamix blender! I used some graduation money to splurge on a Vitamix a few weeks ago and have been loving it! It was the perfect tool to make this smooth and creamy soup. So, what I now know about vichyssoise is that it is traditionally a creamy potato leek leak soup that is eaten cold. This was basically that with the wonderful addition of asparagus. There is just a tiny bit of cream and a little Greek yogurt to help make it really nice and creamy with just a bit of tang from the yogurt. 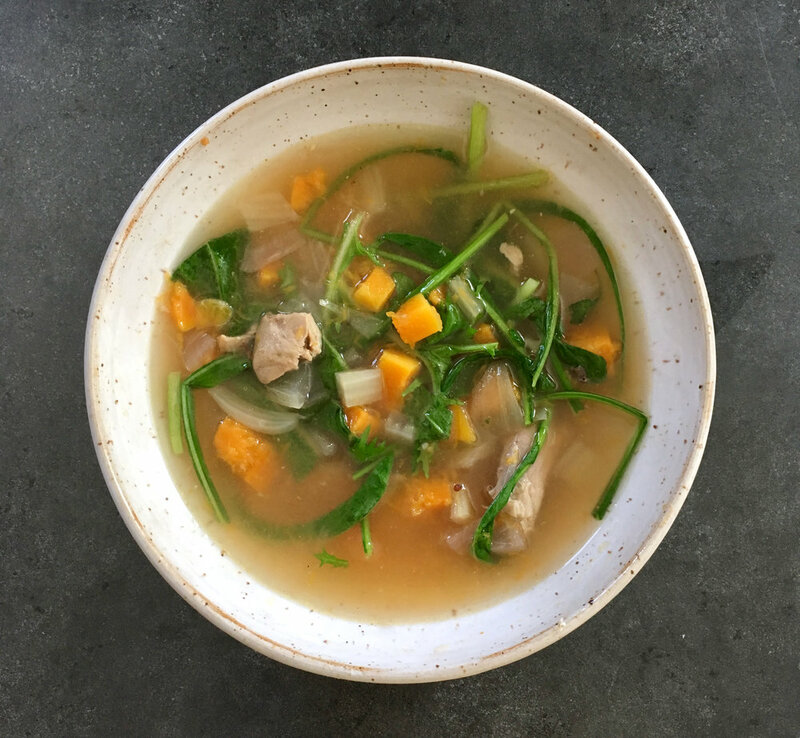 A wonderfully healthy and light soup for a hot spring day. This is a very simple recipe that does not require a lot of hands on time. All you really need to do is cut up a few veggies, throw them in a pot with some stock and let them cook for a good 40-50 minutes. Then blend away until very smooth with some cream and yogurt and move to the fridge to get nice and chilled. You can garnish with some extra shaved asparagus or a little dollop of cream or yogurt, or a drizzle of olive oil, whatever sounds good to you. I have no doubt you will enjoy this delicious and refreshing spring soup. Peel the potato and dice roughly. Chop off and discard the tough green ends of the leeks. Cut through the pale center, then wash well and slice roughly. Trim off and discard the woody base of the asparagus. Cut all but two of the spears into 3/4-inch pieces, keeping the tips separate. Reserve whole spears. Place the vegetables, except for the asparagus tips and reserved whole spears, with the butter in a medium saucepan and sauté on medium heat for about 4 minutes; make sure they don’t take on any color. Cover the vegetables with the stock and add the sugar and some salt and white pepper. Bring to a boil, then simmer, covered, for 40 minutes. At the end of this time add the asparagus tips and continue cooking for 10 minutes. Once done, blitz the soup well in a blender until very smooth. Gently fold in the cream and half the yogurt. Allow the soup to come to room temperature, then chill. While the soup is cooling down, bring a pan of water to the boil and blanch the reserved asparagus for 2 minutes; drain and refresh under plenty of cold water. Shred. Pour the chilled soup into bowls and serve with a dollop of yogurt swirled in and topped with the shredded asparagus and lemon zest if desired. It's squash season at the farmer's market and grocery store, I just wanted to let you know in case you've missed the giant piles of butternut, spaghetti, acorn, delicata, hubbard and other squashes that seem to have taken over everywhere produce is to be found. I don't know about you, but I never tire of delicious winter squash, never. I love the sweet and creaminess of this extremely versatile vegetable. You can eat it on it's own, sweet or savory, you can add it to salads, soups, stews, chili, pasta, or you can add the mashed flesh to baked goods, smoothies, oatmeal...the list just goes on and on. I have been baking up squashes left and right over the past couple of weeks. I love having already cooked squash sitting in the fridge, ready for whatever I feel like making. One of my recent creations was this delicious soup. With a couple of cups of cooked butternut squash hanging out in the fridge and some red lentils that have been trying to make an appearance for some time now, I knew a simple soup was just the thing. The perfect thing to sit down to on a cool autumn afternoon. The inspiration for this soup was a recipe I found on Food52 for a sweet potato red lentil soup. I took the idea and made it my own, substituting butternut squash for the sweet potato and a chipotle pepper for the harissa since I didn't have any harissa on hand. For the spices, I just threw in a mix of some of my favorites such as cinnamon, allspice, nutmeg, chili powder, cumin, coriander, paprika, you get the idea. I didn't measure them. When you're making a quick soup for yourself on a chilly day there's no need to measure or worry about exactly which spices to add. Just pick some of your favorites, add in whatever seems like a good amount and go from there. It's not an exact science, that's what makes cooking so fun, it turns out different every time, but always tasty! Heat a small amount of oil in a small saucepan. Once hot, add the onion and saute for 5-10 min, until translucent and just starting to color. Add the garlic and cook until fragrant, a minute or two. Then add the carrot and enough water to cover the bottom of the pan, let cook over medium heat, covered, until carrot begins to soften. Then add chipotle, stock, lentils, butternut squash and spices. Cook until everything is soft and cooked through, 20-30 minutes, adding water as needed to reach your desired consistency. Transfer soup to blender and blend until smooth. Return blended soup to pan. (Alternatively, use an immersion blender to blend soup until smooth.) Add water more water if needed. Taste for seasoning and serve, garnishing with cilantro if desired. I woke this morning and checked the old temperature gauge (aka my phone) to discover it was a balmy -6° Fahrenheit, not the windchill, the actual temperature (the windchill was a lovely -20°). In these kinds of conditions I crave something warm and hearty, simple yet filling and flavorful. This recipe was the first time I've tried chana dal. I spent some time researching exactly what chana dal is, and to be honest I'm still a little confused as to whether it is split lentils or split chickpeas or something else. Whatever the case, it is some kind of dried pulse or legume. If anyone has a good explanation of what dal is please let me know, I'd love a good definition. Regardless of what exactly dal is, this recipe is simple and filling. Dal cooked with tomatoes, onions and various spices. and finished with cilantro and a squeeze of fresh lemon juice. It doesn't get much easier than this, and it is so healthy. If you are looking for something hearty and warming this winter that's a little different than the norm, give this recipe a try. A thick slice of hearty bread on the side to mop up all the extra juice is the only other thing you need to finish off this delicious meal. All this recipe really requires of you is a little time. Chop a few vegetables, throw them into a pan with the lentils and a few spices and let it all cook away for an hour or two. When it's finished cooking you just need to add a few garnishes for freshness and a little more flavor. Then plate up and dig in. There is also so much room for innovation and creativity in this dish. Add some extra veggies, some different spices, another herb, whatever you like. In the end, I don't think you will be disappointed. Note: If you soak the lentils in cold water overnight or for an hour prior to cooking, you can reduce the cooking time from 1½ to 1 hour. Coat bottom of a large pot with oil and place on medium-low heat. Add sliced onions and cook for 30 minutes; checking every 10 minutes. Cook till onions wilt and turn golden. Add chopped tomatoes, tomato paste, turmeric, salt and chilli pepper and turn flame to medium-high. Sauté for 2-3 minutes till tomatoes look jammy (i.e., their liquid has reduced). Add boiling water, lentils and ginger. Reduce heat to low. Stir and cover pot with lid. Simmer until lentils are tender- test a grain between your thumb and forefinger- about 1½ hour. Remove and discard the ginger slices. The proceeding steps are optional; they are for those who want a thicker, soup-like consistency. If you don’t want a soup, but a traditional Pakistani-style Chana Dal, once the lentils are tender, loosen them with a little bit of water till the desired consistency is achieved and taste for salt and red chilli pepper. Serve with fresh, chopped coriander on top. When lentils have cooled, transfer 1 cup of lentils and process in a blender till smooth and creamy. Loosen with a little bit of water. Pour back into pot. (For those of you who have an immersion blender, you can blend the soup directly in the pot.) Slowly add boiling water to soup till desired consistency is achieved. Taste for salt and red chilli pepper. Serve with fresh coriander or your favourite herb; a sprinkle of paprika or sumac (optional); a drizzle of very good olive oil and lemon wedges to add tanginess. I don't know where summer went, but this weekend is definitely feeling like fall. It's so funny though, the leaves have not even started changing colors yet which is super late. So even though it feels like fall, it has yet to look like fall, a very strange combination. I'm not quite ready for the cool weather to start moving in, I want to eek out every last drop of summer that I can. 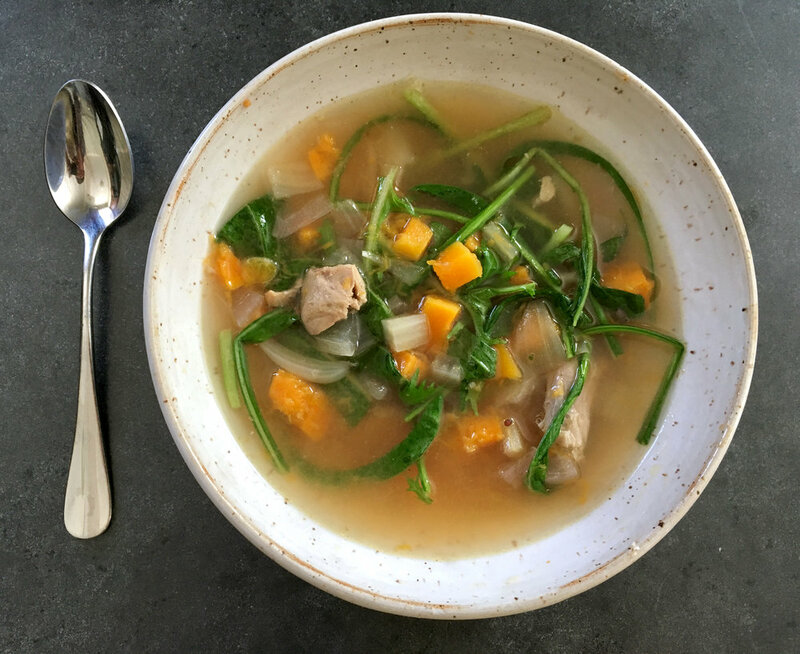 Pining for summer, but dressing for fall, this soup is the perfect way to get the best of both worlds. A creamy and comforting tomato soup using fresh, perfectly ripe tomatoes from the farmers market and basil straight from the garden. It's pure summer in a bowl, yet warming enough to fight off the beginning of autumn chill that has decided to drop by, a winning combination. Before making this soup, I looked at a few different tomato soup recipes and then I put together my favorite parts of all of them, using what I had on hand. Tomato soup is so easy to make, and it is so delicious. If you've never had homemade tomato soup, and have only ever suffered through a bowl from a can, you don't know what you're missing. I used to think I didn't like tomato soup. Then I discovered that I just don't like canned tomato soup. Homemade is infinitesimally better, it isn't even comparable to the stuff out of a can. And while I used fresh tomatoes, canned tomatoes make a pretty good soup too, so in the middle of winter you can still whip up a batch. So if you've never tried making your own tomato soup, I urge to to give it a try, it is so easy and so worth it. Cut tomatoes in half or in quarters and place on a baking sheet lined with foil. Add the onion and garlic cloves. Drizzle with olive oil and sprinkle with salt and pepper. Roast for 20-30 minutes at 450 degrees. Once vegetables are roasted, transfer to a small sauce pot and add the stock. Bring to a boil. Remove from heat and use an immersion blender to puree the soup until smooth. Return pot to heat and add the salt, sour cream, lemon juice, sugar, red pepper flakes and basil. Let soup simmer for 15-20 minutes to allow the flavors to blend. Serve, garnishing with more basil and parmesan cheese, or more sour cream.